The Coalition of Persons with Disabilities NL applauds the powerful “Access Denied” series led by CBC journalist Ramona Dearing. The series begins October 22, addressing many issues that people with disabilities face, from public washrooms that aren’t accessible to being socially isolated to difficulties finding employment. The week-long series features news articles, and radio and television reports commanding attention to current issues facing persons with disability in Newfoundland and Labrador. To preview the promotional trailer for this series, click HERE. 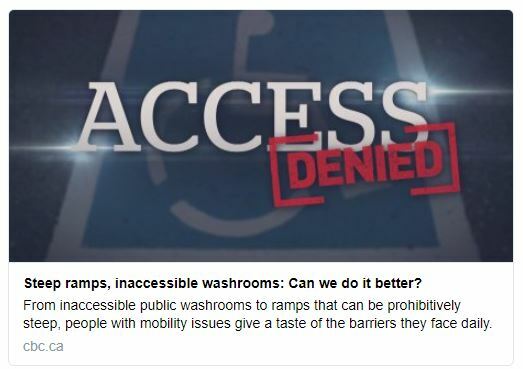 You can also follow the ongoing coverage of accessibility issues and solutions this week online, on CBC Television’s Here & Now and on CBC Radio One. The Coalition encourages everyone to take in the Access Denied series to continue these important conversations. Let’s talk solutions!